Discussion in 'iPhone Accessories' started by Jimcoleman1, Feb 2, 2011. Let's talk about cases for our new Verizon iPhones... I'm sure all the die-hards are aware that the Verizon iPhones physical specs will differ slightly from it's AT&T brother. 1. Anyone have links and info for Verizon iPhone cases? 2. How about current AT&T iPhone cases that would also fit the Verizon version? The key is the mute switch. The mute switch is slightly lower on the verizon phone. If you have a case that has an opening from the mute switch to the buttons (think incase slider), then you should be fine. In answer to the second option, I have already bought an existing case for my Verizon iPhone. I got a Speck Fitted case. It has a single opening on the side for all three buttons and will accommodate the slight modifications in the new antenna design. On the Apple website it lists whether or not the case will fit with at&t and verizon models. I find this kind of hard to believe though. Apple's Store now says this! I'm confused how they can guarantee this. 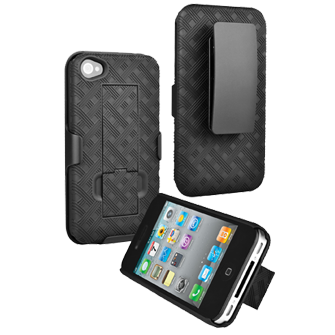 All iPhone 4 cases available through the Apple Online Store are compatible with models for both AT&T and Verizon. Anyone got info on this case at VZW's accessories page? incipio is claiming to be the official release partner of the cdma verizon iphone so they should have cases, i also saw that they tweeted that the ngp does fit both phones!!! O rly? That's the one I want anyway, can you link to the tweet? Are you sure? I saw the tweet, but I don't remember is saying anything about the NGP. Even on their site the only verizon compatible case that shows up is the Silicrylic. The NGP won't fit both, the vibrate switch cutout is not that large.. I think they mean the Feather or Edge because they are open on the sides for the switch and buttons. Our current NGP works for the Verizon iPhone 4. Thank you! RT @jonlong724 @myincipio Will there be a NGP case to fit the Verizon iPhone? I see it, but it just seems that the cutout for the mute button is centered for the ATT version. Seems to me that for the Verizon version it would be off-kilter. i agree but thats what they said so it might work but be slightly off not sure. Guys, most cases will fit...only the vibrate button has been moved toward the volume buttons. Any case with an open hole in the side will work. everyone is aware of the differences in the iphone versions. the ngp does not have a open cutout for volume buttons a switch, some case companies say they will work and some dont, such as incipio says ngp will work on twitter but on website is doesnt say anything. I'm waiting until they officially announce. If my phone has to go nekkid for a couple days next week so I can have the right case, I'm OK with it. I emailed Pinlo a couple weeks back asking if they would make a Slice 3 for the Verizon iPhone. They said it would be ready at the beginning of February. I'm hoping it's on their site soon. If not, I'm trying to determine if the version they sell now will fit the Verizon iPhone. If that doesn't work out I'm gonna go with the Incipio Feather.